In reading the blog of another today, I was reminded of this study, our intent to post regularly, and my lack thereof. Before I allowed guilt to infuse my day, I considered the words I was reading and determined not to stress over creating content when I could borrow someone else’s words that so adequately summed up the purpose of this group. So, I reference segments of Elisabeth Corcoran’s recent article at Crosswalk.com. Not a happy moment, to be sure. And it’s hopefully not true every day. . . but it was certainly true that day. Those thoughts can be debilitating, but they don’t have to be. And, as God‘s cherished children, we know it should never be. However, we are all subject to failing and falling . . . and so some days, it is. debilitating. crushing. overwhelming. As Elisabeth said, “on days when I’m not a total train wreck, I take it to Jesus instead of 10 million other substitutionary devices that fill for a second and then drain me right back out again. This morning, I did take it to Jesus. I believe this is the heart of the intent of the series, Falling, Living and Forever in Love with Jesus. The idea that Jesus Christ can fulfill the above longing in our hearts as believers, but particularly as women. It’s a question of intimacy – of knowing and being known, of being desired and pursued because we are valued. And, it’s the need to have Jesus remind us of all the things He has done in us and also continues to do in us, as we walk with Him. As Elisabeth said, “He [Jesus] already promises that he’s in me, that I have everything I need, that I am precious to him, that he pursued me before I knew him, that he’s especially close to those of us who are heart-broken, that he is my peace, my joy, that my Maker is my husband. So, he’s answered once and for all, and he does answer again and again. I too know and believe and have experienced all these things to be true. But, as that frail little girl sometimes looks in the mirror and, in a moment of vulnerability, is overwhelmed by the sting of being unloved, at least in a tangible way, of feeling unlovely and yes, dare I say it, unlovable – it’s on those days that I’m knocked down, dragged under the smothering wave of inadequacy. It’s those days that I need to be reminded again, when I need to sit at the feet of the One who gave Himself for me. When I long for His healing hand and pray that His mercies are indeed new every morning and that there is room in His lap for me. It’s these times that I remember, like Elisabeth, that this is only part of my story. And it does make me love my friends better and deeper. And it makes me pray harder for them and for me – that we might all have a better understanding of just how wide and long and high and deep is the love of Christ for us. That is worth being overwhelmed by. “It’s the thing that compels me again and again back to Jesus, who knows and sees and understands and heals, and when I’m open, fills me.” Thanks Elisabeth, I couldn’t have said it better myself. So I’m horribly behind on this blog. . . whoever thought this was a good idea . . . oh wait, that was me and I still believe it . . . just need to work on the follow-through. True for many things in my life, not just this blog, but I digress. I had wanted to write a post on Valentines Day, Single Awareness Day in some circles, celebrating the neverending, unconditional, forever kind of love that God offers to those who love Him, but I never found the time. Lucky for me, someone over at Crosswalk.com did. In a wonderful article titled, “When Your Heart Longs to be Romanced,” Cindi McMenamin makes some interesting points about V-Day . . . you’ll have to go here, http://www.crosswalk.com/family/marriage/when-your-heart-longs-to-be-romanced, for her story. But now, for the verses – read and hear the voice of God calling to you . . . He calls you unforgettable: “Can a mother forget the baby at her breast and have no compassion on the child she has borne? Though she may forget, I will not forget you! (Isaiah 49:15). • He says He has always loved you and always will: “…I have loved you with an everlasting love; I have drawn you with loving-kindness” (Jeremiah 31:3). • He calls Himself your Husband: “For your Maker is your husband – the Lord Almighty is his name – the Holy One of Israel is your Redeemer; he is called the God of all the earth. The Lord will call you back as if you were a wife deserted and distressed in spirit…” (Isaiah 54:5-6a). • He promises He’ll never leave you: “…Never will I leave you; never will I forsake you” (Hebrews 13:5b). • He assures you in His Word that He has chosen you as His own: “For he chose us in him before the creation of the world to be holy and blameless in his sight…” (Ephesians 1:4). • He assures you in His Word that nothing will be able to separate you from His ever-pursuing love: “… neither height nor depth, nor anything else in all creation will be able to separate us from the love of God that is in Christ Jesus our Lord” (Romans 8:39). May you rest in the loving arms of your Savior, Redeemer, Healer, Coming King, Husband, Lover, Betrothed, the Author of romance. During the course of this study, the authors define three stages of love, listed above. The First love, that emotional high, twitterpated, sweaty palm, pulse-pounding, catch your breath kind of love, is where Hollywood stops the story. It’s that initial, getting to know you, everything is wonderful and when even the most annoying trait of your prospective partner is adorable. He or she can do no wrong. The second, Wilderness love, is what usually derails relationships. Marriages crumble, buried in the rubble of broken promises, financial challenges, infidelities, illness, conflicting desires, and a myriad of other issues, both great and small. Break-ups, separations, divorce. This is what is displayed in the headlines, it disrupts political campaigns, distorts celebrities, derails careers, disparages sports figures, it destroys, communities, families, and individuals. The final stage is Invincible love. This is the goal, the end game, the one true desire – it’s the refined, been through the wringer and come out on the other side stronger, deeper, will not fail, and is not dependent on circumstances. This is the kind of lasting love that results in years and years of marriage. . . it’s indescribable. It moves beyond hormones, survives the dry barrenness of trouble, hardship, and disinterest, and develops into a living, breathing, organic thing that grows as it’s nurtured. I equate this last form of love as Unconditional. The blueprint can be found in 1 Corinthians 13 . It’s what we as believers strive to model and offer to others. Unfortunately, because of our own limitations this side of Heaven (and the perfection that’s promised), we fall far short, both in giving and receiving this kind of love. In fact, it’s only God that truly can and successfully does, offer unconditional love to us. LOVE – such a loaded word. As our previous posts reveal, it can mean a variety of things depending on the lens you select to look through. One thing I find interesting though, is even in the few perspectives we’ve looked at, proximity is a continuing theme. Closeness, spending time with someone, observing their behaviour, asking questions, finding out why they do what they do . . . that’s an important part of falling in love. If, to truly know God and not just know about Him, we need to spend time with Him. . . how does one do that with God? It’s an important question, and one we cannot answer 100% to everyone’s satisfaction, but we will try to address at least several options in this post, and provide opportunities during the course of the study. And, since it’s a Bible study . . . . we’ll need to look at love – and ask that you at least be willing to consider looking at love, through God’s lens. 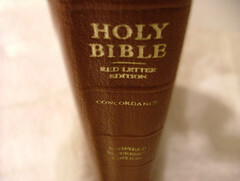 The word Love is in the NIV version of the Bible 551 times in 505 verses . That’s a lot. There are over 100 verses that have God and love together, and there are over 50 that specifically reference God’s love. The shortest definition, but by no means the most clear is “God is love”. This is found in 1 John 4:16 – just a portion of that verse. So, trying to break this up into small pieces, I considered this question – How does someone handle a long-distance relationship? These are tough for sure. You and your loved one, separated. . maybe you’ve met and spent time together but now you are apart. . .perhaps you haven’t met in person. (I hear the internet is a growing source for dating relationships) How do you get to know one another, how do you keep the interest . . especially with someone you can’t see or feel or touch? Technology being what it is, we can do so many things – we can communicate by email or writing, we can Skype if we have a webcam and hi-speed internet access, we can get to know their friends and family, we can speak by phone, and we can take trips or plan to meet halfway. Now, apply these methods to God. While we cannot Skype with Heaven we have many letters and writings that God has provided. (Yes, I mean the Bible). We can attend a church service, and hang out with God’s friends and family – with those who are called by His name and profess to be His children. We can read additional writings, books about Him, written by respected leaders in His community. We can pray, which is like speaking on the phone . . . so long as we allow for long pauses where God gets to speak to us. . . . hard when those pauses can sometimes feel so awkward. We can make room for God in our lives by scheduling time to spend with Him – this can be a few stolen moments early in the morning before those in the house start to stir or later in the evening as everyone settles in for the night. It can be time in the car during all those commutes or while providing taxi service (come on Mom’s, you know what I mean). We can attend retreats, silent or focused, to set aside an evening or a weekend, to help us be still and know Him. Not always a satisfactory answer. It’s not as real to us, when we can’t feel His arms around us, or carry on a conversation. . . and yet, there have been times in my relationship with God, when He has seemed that real. When it’s almost as if I can feel his breath on my cheek. That’s the kind of intimacy that I long for. To feel that closeness, to know with absolute certainty that He is with me. Intellectually I know this. I can quote verse after verse that promises this. I can say with confidence that I believe it. I can say with that same confidence. . . that I don’t always feel this way. And I want to. And I believe that this is what it means to fall in Love with Jesus.